Former Yemeni President Ali Abdullah Saleh Thursday was reaffirmed as key player in restoration of peace in the poorest Arab country as thousands of supporters of the deposed leader turned up at a rally in capital Sanaa to defy Shia rebel Houthis who have called for his death despite being an ally. Supporters who arrived in throngs from all sides of the country cheered the 75-year old strongman who addressed the gathering from bulletproof glass, surrounded by heavily armed guards. The supporters waived blue flags of Saleh’s Arab nationalist General People’s Congress (GPC) as the rally also marked the 35th anniversary of the party. 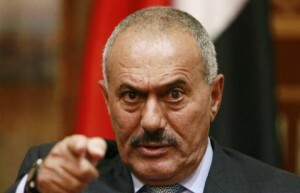 “We are political pioneers with a solid anchor, and we have been facing conspiracies against us since 2011,” Saleh said. Analysts say the rally is a defying sign towards Shia Houthi rebel group now in control of the Yemeni capital. Saleh joined the Iran-backed rebel group in 2014 to ouster Saudi-Arabia-backed President Abedrabbo Mansour Hadi. The coalition drove President Hadi out of capital Sanaa in 2015 and the Yemeni leader had to relocate in the second city of the country, Aden. The alliance has established National Salvation Government in Sanaa in parallel to Hadi’s government in Aden. The Salvation Government is not recognised by the international community. Tension has brewed between the GPC and the Houthis recently. The Shia rebels have vowed death to Saleh whom they accused of negotiating with Saudi Arabia, which leads an international coalition of Arab countries fighting the Iran-backed rebels and GPC. The GPC also has accused the rebels of monopolizing the government and media organs. GPC refused to be a “junior partner” in its alliance with the Houthis against the Saudi-backed government of President Abdrabbuh Mansur Hadi, the GPC’s Secretary General Arif al-Zouka noted. The alliance has also fallen apart over the GPC’s contribution to the war, representation in peace consultations, judicial issues and educational curricula, reports say. Saleh was forced to step down in 2012 after surviving the Arab Spring. Yemen has been in a state of war since 2014 and UN peace efforts have so far failed. Over 10,000 people have been killed since 2015 according to the UN. The poor country has been also struck by a cholera outbreak, which has killed so far more than 2,000 people. Posted by KanelkaTagba on Aug 25 2017. Filed under Gulf News, Headlines. You can follow any responses to this entry through the RSS 2.0. Both comments and pings are currently closed.